Queen Anne is the first large Seattle neighborhood with a median price above $1 million, as home prices across the region continue to climb. The Eastside set a record as well. As Seattle home prices continue to set records, Queen Anne has officially become Seattle’s first big neighborhood to have a median home price of $1 million. 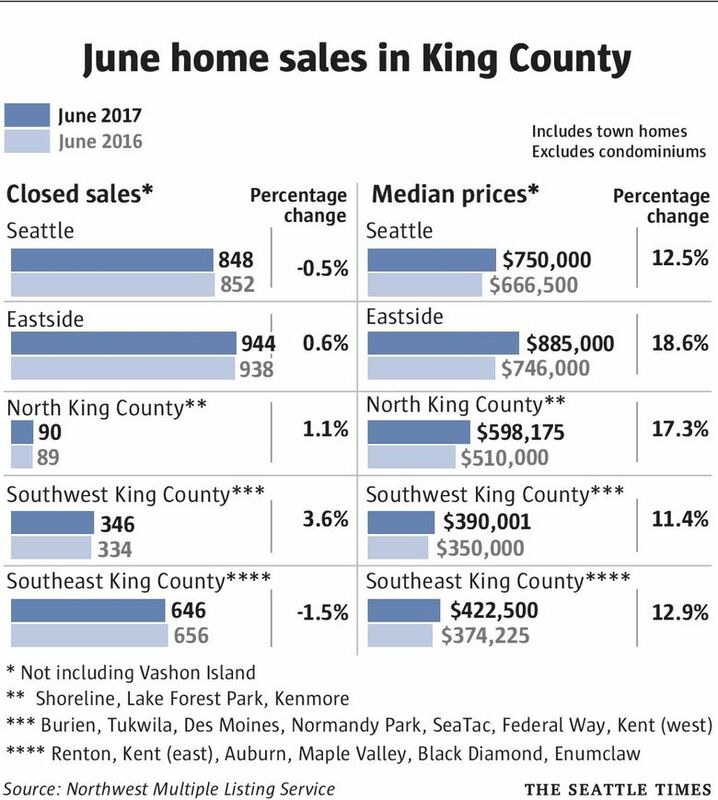 Both Seattle and the Eastside once again set price records in June as prices rose throughout King County and other central Puget Sound counties, according to the latest monthly data from the Northwest Multiple Listing Service (NWMLS). Seattle, which has been setting records for months, reached $750,000 as the new midpoint for home prices — $21,000 above the previous month’s median price. The Eastside beat an all-time high set in April, as its typical home prices last month rose to $885,000. For King County as a whole, the median home price reached $653,000. Queen Anne’s jump to become the area’s first large neighborhood where a million-dollar home sale is typical resulted from a steep jump in the median price: to $1,001,779, up 11.3 percent from May’s $900,000. Melissa Klinnert, a longtime broker with Steve Kennedy Team on Queen Anne, said the high and rising prices in that part of town make sense given the strong demand and the low inventory. “It’s the most convenient neighborhood for downtown Seattle with a great sense of community,” she said. Areas with easy commutes to downtown Seattle are seeing high demand, she added. May’s median house pricing showed the Capitol Hill area nearing the million-dollar mark, but that neighborhood’s median dropped back down in June to $890,000 this month — still $100,000 higher than last year’s median price. Mike Grady, president and COO of Coldwell Banker Bain in Bellevue, said the rising prices showed a tight market with more new jobs than new housing. “This pattern won’t change until developers can out-build net new job creation, especially in the Greater Puget Sound area,” he said in a NWMLS statement. Klinnert said the influx of people moving in with high-paying jobs, especially in the tech industry, is contributing to strong sales and low inventories. Last year the Seattle metro area, extending to Bellevue and Tacoma, saw a net gain of 1,381 in population per week, according to Census data. Low inventory means that houses in the Queen Anne area are typically on the market for just five to seven days, and Klinnert said many houses attract offers in as little as 24 to 48 hours. King County’s Southwest and North regions saw some price drops. In Southwest King County cities like Burien and Federal Way, typical homes are $390,001 compared with last month’s $400,000. Median homes in North King County, with cities like Lake Forest Park and Shoreline, were just under $600,000. The typical home in Southeast King County, which includes cities like Renton and Kent, rose $2,500 to $422,500. Rising prices across the entire region continue to leave few options for people being priced out of Seattle. For the second month in a row, house prices in the central Puget Sound region have maintained or set records. Pierce County topped $300,000 for the first time in May, and once again rose in June to a median of $317,000. 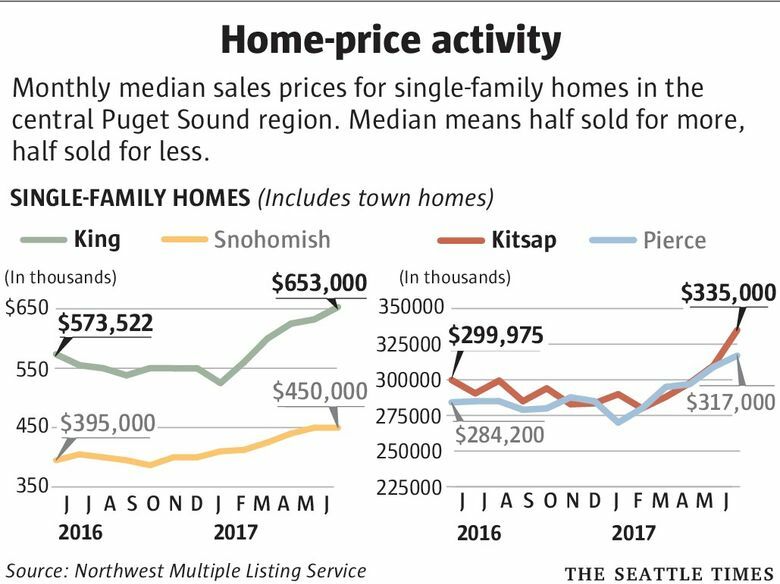 Kitsap County’s typical price rose to $335,000. Snohomish County’s typical home now costs nearly half a million dollars. Scott Comey, the owner RE/MAX Elite in Lynnwood, said in a statement that Snohomish County is seeing more tech workers buying homes and looking north to get more bang for their buck. “Many of my agents have clients from Microsoft, Amazon and Google, to name a few, where just a couple of years ago we rarely saw them up this way,” Comey said. The supply of condominiums for sale is also decreasing in the Puget Sound region, down 24 percent from a year ago, according to NWMLS. 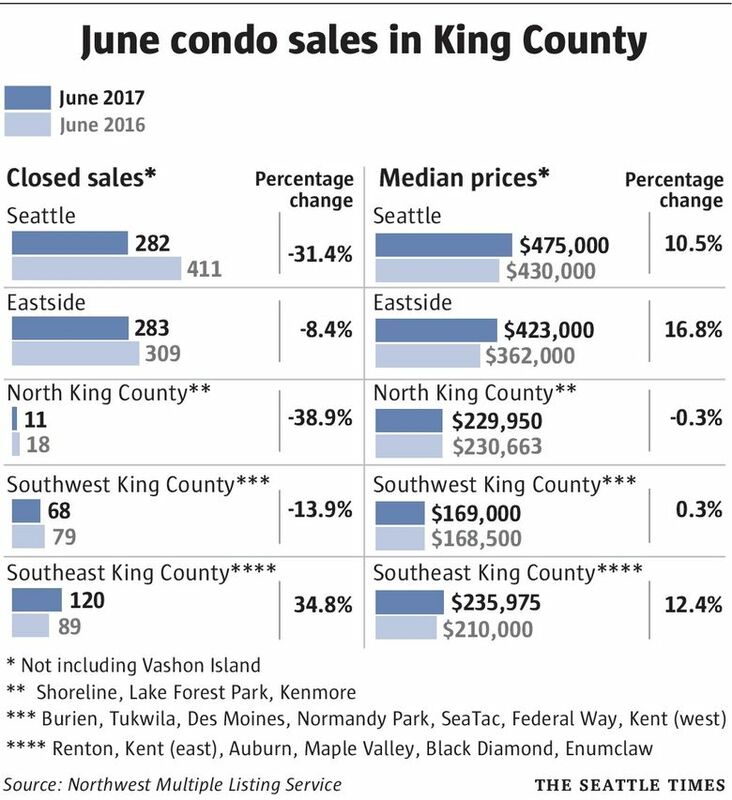 Condominium pricing rose in both Snohomish and King counties. The average condo in Seattle is now priced at $475,000. Klinnert said buyers are having to sacrifice either some aspects of their dream home, such as the number of bathrooms, to be in a neighborhood they want, or sacrifice by buying at a greater distance from where they may want to be. “Jobs in Seattle are still getting stronger, the economy is not yet at full strength, incomes are starting to rise, loan interest rates are low, money is relatively easy to borrow, gas prices are low, the stock market is doing well and the public’s attitude seems to be good. This could last a few years,” he said. This story has been updated to correct information about the number of people moving to the Seattle area.